Just after the International Quantum Electronics Conference, which took place in Tokyo, July 18-21, 1988, a symposium on "Nonlinear Optics of Org~ics and Semiconductors" was held on the Hongo campus of the University of Tokyo on July 25 and 26, 1988. Recently, nonlinear optical materials have started to attract the attention of many scientists, not only in the field of quantum electronics but also in organic chemistry, and solid-state physics, especially semiconductor physics. Therefore this area of investigation is really interdisciplinary and necessitates understanding from different viewpoints for continuous growth of the research activity in the field. 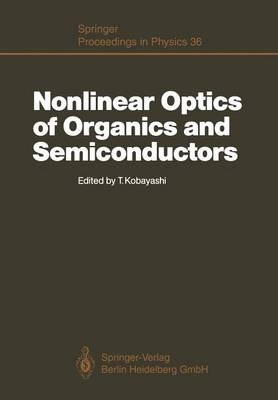 This book contains many papers written by scientists active in the field of nonlinear optics of organic materials and semiconductors. The first two parts of the book discuss mainly the basic physics of nonlinear optics of semiconduc- tors, including bulk and quantum well structure semiconductors. The papers in Parts ill-VIII concern mainly organic materials. They include the calculation of molecular polarizability, synthesis, the measurement of optical nonlinearity and characterization. The final part is on potential device applications. The symposium was organized in collaboration with Prof. Shinsuke Umegaki of Tokyo Technical Institute, and Dr. Hachiro Nakanishi of the Research Institute of Polymers and Textiles. Preparations for the conference were made with the help of Dr. Masayuki Yoshizawa, Miss Nanae Indou, Mrs. Yoko Sasaki and graduate students (Mrs. T. Hattori, M. Terauchi, K. Ichimura, A. Terasaki, K.
Illustrations note 19 Illustrations, color; XI, 322 p. 19 illus. in color. I Fundamental Physics of Semiconductors.- Phase Conjugation Enhanced by Weak Localization of Exciton Polaritons.- Dimensionality and Scaling in Nonlinear Optical Susceptibilities.- Fundamental Nonlinear Limits and Generation of Quantum Light States.- A Simple Theory for Excitonic Optical Nonlinearity in Semiconductors.- II Semiconductors.- Ultrafast Dynamical Nonlinearities in Epitaxial III-V Structures.- Room-Temperature Optical Nonlinearities in Multiple-Quantum-Well GaAs/AlGaAs and Bulk GaAs.- Optical Nonlinearity Due to Resonant Intersubband Transitions in Doped Quantum Wells.- Relaxation Processes and Optical Nonlinearity in Semiconductor Microcrystals Embedded in Glasses.- Dephasing Time of CdS Microcrystallites Measured by a Simple Method Using Incoherent Light.- Very Large ? (3) Due to Coherency of an Exciton in PbI2.- Excitons and Excitonic Molecules in CuCl Microcrystals.- CdS Particle Doped Polymer Films for Nonlinear Optics.- III Organics: Calculations.- Design of Novel Conjugated Molecules with Large Hyperpolarizabilities.- CNDO/S-CI Calculations of Hyperpolarizabilities. I: Substituted Benzenes, Polyaza Compounds and Related Species.- CNDO/S-CI Calculations of Hyperpolarizabilities. II: Clusters of Formaldehyde, Urea and Nitrobenzene.- IV Molecules.- Complex Hyperpolarizability and Solvatochromic Effects in Merocyanine Solutions.- Nonlinear Optical Properties of Retinal Derivatives.- V Polymers.- Nonlinear Optics in Doped Amorphous Polymers.- Electro-Optic Constant of Doped Polymers by a Novel Method.- Molecular and Crystal Engineering of Polydiacetylenes: Modification of Optical Properties.- Nonlinear Optical Properties of Polydiacetylenes with ?-Conjugation Between the Main Chain and the Substituents.- ? (3) Evaluation of Organic Nonlinear Optical Materials by THG Measurements.- Resonances of Cubic Nonlinear Optical Susceptibilities in Polydiacetylenes.- Third-Order Nonlinear Susceptibility of Polyalkylthiophene.- Highly Oriented Polydiacetylene Films for Possible Nonlinear Optical (NLO) Application: Method of Fabrication, Morphology and Some NLO Properties.- Nonlinear Optical Properties of Polymer Ion-Dye Complexes.- Nonlinear Polysilane Thin Films.- Alternating Copolymer of Vinylidene Cyanide and Vinyl Acetate: A New Nonlinear Optical Material.- VI Molecular Crystals - Single Crystals.- Dispersion of the Second-Order Nonlinear Optical Coefficient d11 of Organic Crystal 2-Methyl-4-Nitroaniline.- Synthesis and Second Harmonic Generation of Deuterated L-Arginine Phosphate Monohydrate Crystals.- Crystal Structures of a New Organic Second Order Nonlinear Optical Material [Cyano(ethoxycarbonyl)methylene]-2-ylidene-4,5-dimethyl-l,3-dithiole.- Maker Fringe and Phase Matched SHG Studies of Crystalline Dicyano Substituted Benzene Compounds.- Nonlinear Optical Properties of 2-(?-Methylbenzylamino)-5-nitropyridine.- Pockels Effect in Organic Thin Films.- VII Molecular Crystals - Powder.- Synthetic Design of Organic Nonlinear Optical Materials: Cyanovinylheteroaromatics and Related Compounds.- Optical Second-Harmonic Generation from a Series of [Cyano(alkyloxycarbonyl)-methylene]-2-ylidene-l,3-dithioles and Their Methyl and Dimethyl Derivatives.- Effect of Esterification on Third Harmonic Generation in Several Dyes.- VIII Liquid Crystals.- New Theoretical and Experimental Results on Multiwave Mixing and Phase Conjugation in Liquid Crystals and Semiconductors.- Second Harmonic Generation in Ferroelectric Liquid Crystals.- IX Device Oriented Research.- Measurement of Electrooptic Properties of Organic Thin Films by Attenuated Total Reflection.- Phase-Matched Second-Harmonic Generation in Fibre Waveguides by Electric-Field Modulation of the Third-Order Susceptibility.- Second Harmonic and Parametric Difference Frequency Generation in Organic Nonlinear Waveguides.- Second Order Optical Nonlinearities in Organic Polymer Films and Crystal Cored Fibres.- Frontier Materials for Organic Nonlinear Optics.- Time-of-Flight Measurement of Excitonic Polaritons in a GaAs Quantum-Well Waveguide.- Second Harmonic Generation from a Monolayer on a Water Surface and Accumulated Structure on a Glass Substrate (LB Film).- Femtosecond Pulse Compression Using Highly Nonlinear Organic Materials.- Picosecond Third Harmonic Generation in ?-BaB2O4 and Calcite.- Index of Contributors.